We're celebrating our 20-year high school reunion. 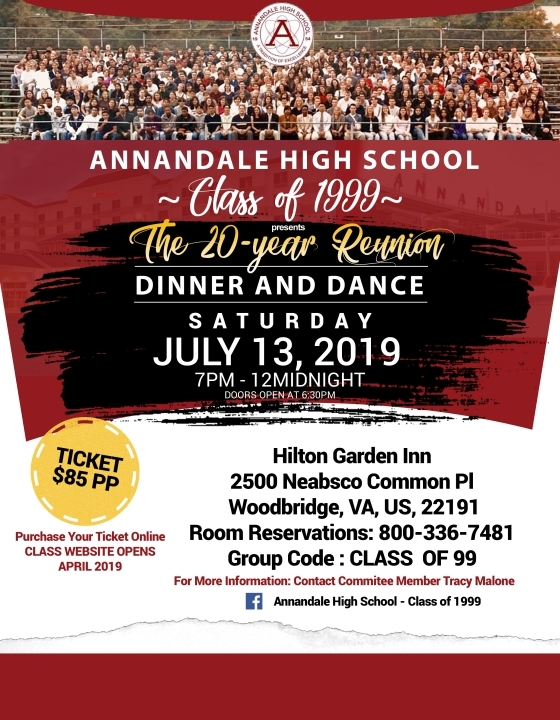 Join the Annandale High School’s Class of 1999 for a weekend to remember! Come take a trip back down memory lane, reconnect with your classmates, and enjoy a weekend full of great food, fun and laughter. Attend every event, or, attend just one. We hope to see you at least once during the weekend. It won't be the same without you! Friday, July 12, 2019 -- Food, Drink, Cocktails & Bull Rides/Meet and Greet. Cadillac Ranch. 186 Fleet Street, National Harbor, Oxon Hill, MD 20745. 7pm – 11pm. Dress code: Casual. Cost - Pay for your own food and drinks. Saturday, July 13, 2019 – Dinner Dance. Hilton Garden Inn, 3050 Neabsco Common Place, Woodbridge, VA 22191. 7pm – 12 pm. Dress code: After 5 Cocktail Attire. April 1 – 21, 2019. After that, the cost will increase to $95 per person from April 22, 2019 through June 10, 2019, or until sold out (whichever comes first). In addition, a limited number of tickets for couples are available for $165. Due to limited seating, we encourage everyone to purchase their tickets as soon as possible. Note: Ticket sales are non-refundable, but Transferrable. No tickets will be sold at the door!!! All proceeds from the reunion weekend activities will be donated. Menu: Coming soon (Gluten free, vegetarian options available). Beverages include tea, water, coffee, soda. Presented by AHS Class of 1989 Reunion Planning Committee. Please direct all questions to AHSClassof99@gmail.com. AlumniClass.com (15179) - 10019 E Knox Ave, Spokane Valley WA, 99206.